Alex (Guy) and his cousin Jake (Boldin) are two fun-loving cousins who are just livin’ their lives in the sleepy, rural town of Poolville, Texas. Because most of the town has vacated because it’s hunting season, the two good ol’ boys can feel free to indulge their passions of drinking, skirt-chasing, and gun collecting. The latter is going to come in very handy, however, as trouble comes to town in the form of a man named West (Estevez). West brings his underlings to Poolville because that’s where a mafia hitman named David Montel (Patterson) will be. He’s a prisoner being transported cross-country by a cop-with-an-attitude named Sgt. Phil Towers (Harrod). Once West and his goons start their onslaught in pursuit of Montel, the unlikely allies of Alex, Jake, Montel, Towers, and local barmaid Sarah (Murphy) all have to team up to fight them in a firefight to the finish. Luckily, they’re ARMED FOR ACTION…but so are the baddies! Who will be the saviors of Poolville, Texas? Both Alex and Jake have awesome hair. They have to be cousins because awesome hair must run in their bloodline. Alex’s overgrown curly mullet is extremely impressive, though Phil Towers, the Zack Morris-esque policeman has great hair too, and he’s not related to the boys, as far as we know. Jake rivals him with his Cody-era Sasha Mitchell look. Okay, now that that’s out of our system, let’s proceed. 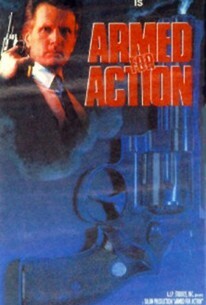 Armed For Action seems to be something of a “forgotten” movie, and one of the least-talked about AIP releases. Hopefully, this review will help to change that, as not only is it a more-than-respectable outing, it’s actually quite impressive what director McCormick and the gang were able to do with such a low budget. Despite some of the almost-prerequisite dumb moments and low-budget pitfalls, this tale of innocent locals caught in a city-versus-country crossfire is the type of movie Hollywood used to make – and still makes today but with an exponentially higher budget, if we just look at The Last Stand (2013). Even David Heavener tried his hand with something similar, Prime Target (1991). While we appreciated the movie’s lineage – it’s essentially an old-style Western – we could have done without the bathroom humor (a pet peeve of ours). When you watch Armed For Action, you enter a rural world where the hometown bar appears to be someone’s house, the Sheriff (Gould) is the only law enforcement in town and he operates out of the General Store, and at the local restaurant you can get something called a smoked bologna sandwich. 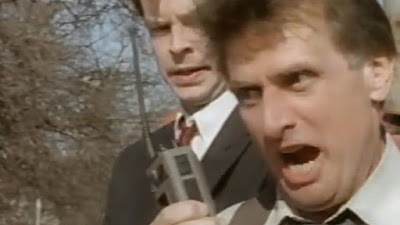 Strange as it is to say, 1992 was a simpler time, and when Joe Estevez (who puts in a pretty wild-eyed performance) and his goons show up, you care what happens to the townsfolk. AFA (as we call it) actually takes the time for character development, which we applaud wholeheartedly. So many movies of this type just skip that. For that reason alone, this small, modest movie is worth checking out. And because Montel looks like Joe Piscopo. That would be our mafia hitman, not Montel Williams. Speaking of lookalikes, West’s main two goons look like Gary Busey and former British Prime Minister Tony Blair. There are a lot of other funny-looking goons as well, but those were our personal favorites. Would that the real guys appeared in an AIP movie together. Well, this is as close as we’ll get. We’ll take it. According to the credits, the weapons were by Weaponmasters, and the stunts were by Stuntmasters. Could they be the same people? The soundtrack was not done by The Beatmasters, but it was done by one Ron Di Iulio, who contributes some catchy countryfied guitar licks to the ensuing action odyssey. Even though many people get shot and\or blown up, Armed For Action represents a filmmaking era that is almost quaint by today's standards. Efforts - and they truly were efforts - like this should be recognized. Thanks to AIP and now Amazon Prime, they can be. Encouraged by the review, I checked this out on Amazon Prime and wasn’t disappointed. The sheer rudeness of this film is beyond belief. But when you consider it was written by Ted Prior and produced by David A. Prior, it all makes sense. I can’t add much more to the review, but I was laughing out loud at this one. The comment about the local bar being someone’s house was classic. Also the scene at the beginning where the guy had a nightmare with the people laughing seemed like it would never end. The causal slaughter of innocent civilians was also hilarious. But the scene which had me doubled over in laughter was during the climactic shootout, when some good just walked out in the open and was shot to death. Man I miss the days of these kinds of films. 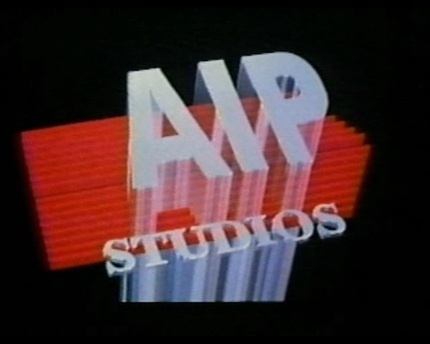 Explosive Action: Well...it's classic AIP and take a look at Force Field's comment below. It is pretty spot on. Force Field: Thanks for dropping by. You nailed it with your capsule review. You described it perfectly. We all miss the days when movies like this were made.